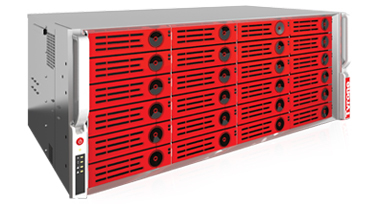 FS2 – Flexible Storage Solutions – is our next generation unified storage solution that supports high performance computing, provides multiple configurations, and delivers best results at affordable prices. By unifying network-attached storage (NAS) and storage area network (SAN) into a single box, FS2 provides the flexibility to use it as a NAS, SAN, or both. FS2 ensures best performance-per-dollar and per-square-feet while lowering your total cost of ownership and energy consumptions. FS2 is compatible with fibre channel—a feature that allows it to support legacy infrastructure. FS2 also supports scalability of up to 576 terabytes and transfer speeds of up to 2 Gigabytes per second when used with InfiniBand.